New York Sea Grant (NYSG) in partnership with the New York State Department of Environmental Conservation (NYS DEC) created the New York’s Great Lakes Basin Small Grants Program to support stakeholder-driven efforts to restore and revitalize the state’s Great Lakes region and demonstrate successful application of ecosystem-based management (EBM). The Small Grants Program - which is made possible by the New York State Environmental Protection Fund and Article 14 of Environmental Conservation Law - supports local projects that lead to larger-scale activities described in the Great Lakes Action Agenda (GLAA), and is anticipated to be available on an annual basis, depending on funding. 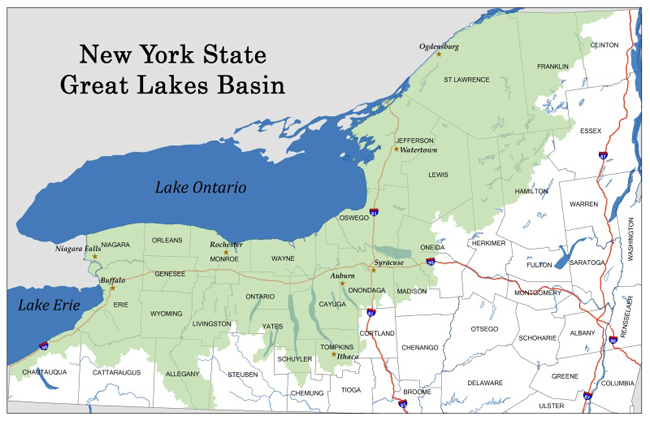 Published by New York State in July 2014, GLAA (also known as "New York’s Great Lakes Basin Action Agenda") is an action plan for the application of EBM principles in New York’s Great Lakes basin. The document identifies pressing problems and actions which will benefit from holistic approaches needed to protect natural resources, environmental quality and economic development. Each year, new priorities may be identified, as sub-basin work group meetings identify regional and basin-wide collaborative actions needed.